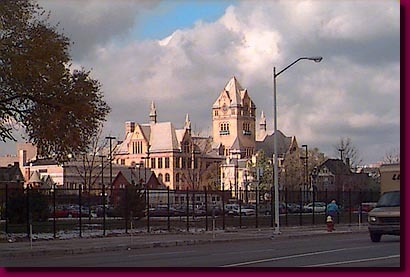 The spires of the recently restored Old Main Hall of Wayne State University can be seen from Woodward across from the Whitney House. Originally built as a Detroit city high school in the 19th Century Old Main Hall became the foundation for Wayne State University, a school of over 30,000 students. Old Main, along with a smattering of smaller 19th Century residences, gives the otherwise recently built campus a touch of tradition.